Re: [PACKAGE] Absolute Hyrule Map Package: WARNING: HUGE! I have another question now. Why are weak walls semi-transparent? The darker lines should be opaque or almost opaque, no? I think there is are slight inaccuracies with the palette of the outside tileset. 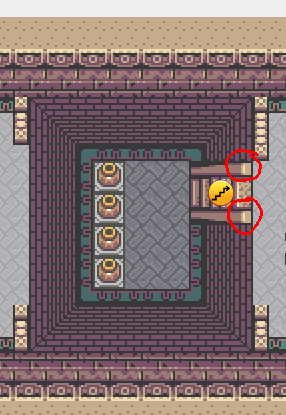 As far as I know, all colors in ALTTP have RGB values that are multiples of 8. 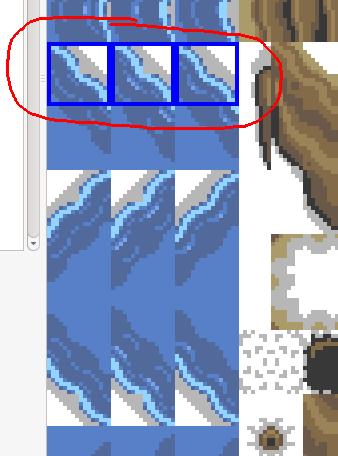 For example, in the dungeon tilesets, the blue tiles used for deep water should be 56,96,168. This is the value I have from Hyrule Magic. (Or 88, 128, 200 in the PAL version, because there is an offset of 32 for all 3 RGB values). In your tileset, this color is currently 57,99,173. Not a huge difference, but when transitioning from a map made with my old tilesets to a map made with yours, the difference is visible. It looks like this rule is better respected in your dungeon tilesets. Some white pixels instead of transparent in the torch. I reported it a while ago, apparently it is only okay in the bright blue tileset (ice colors). The blue color of the water can be fixed easily, but given the tileset currently has 1,079 colors in it, it would be more difficult to go in and change all of them to match perfectly with the palette of Hyrule Magic. 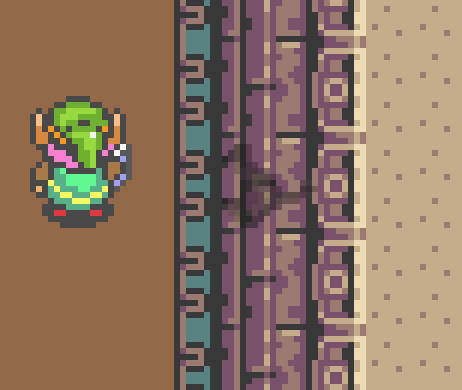 I also have palette swaps of tiles containing colors Hyrule Magic does not have. The Dark World water tiles have a slightly different shade in the dark color because I felt that black color in the waters' walls was less appealing. I think (and I can be wrong) that for the most part, most of the remaining tiles are correct in color, or at least close. I fixed the bug (once again) for the tall lamps. If you want I can revert the semi-transparent colors for the weak walls back to opaque. I can change the color of the water in the outdoor tileset as well, but changing the entire thing to perfectly match the colors in LTTP might be more challenging than the dungeon tilesets' palettes. Yes, weak walls lines should be opaque, it does not look good otherwise. About the outside palette, it will be good enough to only fix the most used tiles. Can you just fix the water ones and the grass one (the main green color background used everywhere in ALTTP)? Alright I'll fix the weak walls. I also went in and fixed the outside tileset. I realized that when I made it, I did not place a grass tile down next to the water tiles. Originally, I had it set in my mind that users could pick whatever tile color they wanted so there would be no need for a grass tile, as it would be redundant. 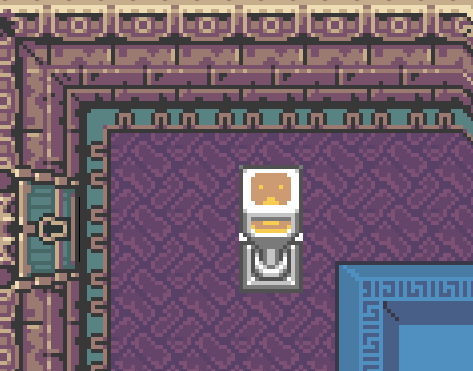 However, looking back on it, and with your comment, I decided to add it back for simplicity, as finding the tile in the palette proved difficult even for me. I have replaced the origfinal grass tile by placing it next to the water tiles. The two 8x8 tiles of the upper part (stairs_inner_up.1.top.border.1-1) should be have the "low wall" ground type rather than "wall". Low walls will allow projectiles to pass, including the hookshot, arrows, etc. Okay I'll fix those. Should I do this for all the stairs or just the ones turned to the side? For all 4 directions of plaftorm stairs. By the way Chris. I noticed that whenever I overwrite files in the webspace you provided for me, visually it appends rather than replaces. When I browse folder in the directory, there are multiple folders and files with the same name, and the number grows every time I try to replace a file or folder (I have made 4 edits to the tilesets in question, and have replaced the package more than once...and there is an extra duplicate of every file for the number of times it has been replaced. Is that something I need concern myself with? It must be a bug of your FTP software. There are no duplicated files, I checked. MRWhale: please elaborate, what are you trying to do exactly? They should have the diagonal wall/water ground properties, not deep water. These are not including NPC soldiers the hero finds before going into Hyrule Castle for the first time, or the ones seen outside the castle at the end credits. Currently I have ten variants of the simple soldiers and the Sword Knights. I am working on Sword Knight type 2. These knights can be found inside Hyrule Castle Tower, and are the ones which more closely resemble Chris' soldiers in Mystery of Solarus.